The Temporomandibular Joint (TMJ) connects the jaw (mandible) to the cranium (temporal bone) of the skull. The temporomandibular joint is a “synovial” joint (a unique joint different than other arthrodial joint in the body in that it has both an upper compartment (space) above and below the articular disc which is located between the two condyles (the top portions of the mandibular bone on both the left and right sides of the skull. The two bones are held together and function via a complex group of muscles, ligaments and other soft tissue. The temporal bone has a concavity call the glenoid fossa in which the head of the jawbone (the condyle)sits. A cartilage disc call the articular disc separates the two bones. The articular disc slides in conjunction with the mandible to provide smooth quiet movement and acts as a cushion against heavy forces generated by the strong jaw muscles. The right and left TMJ joints do not act as a separate joints, but must move in coordination with one another. The TMJ joints are considered the most complex joints in the human body because they must provide for rotational movements, sliding movements and an infinite range of combined movements and functions, unlike any other joint in the body. The lower jaw (Mandible) has a relationship to the upper jaw (Maxilla). If this relationship is altered, the muscles of mastication (chewing muscles) go into spasm. This causes the muscles that have the same nerve intervention to also go into spasm. The resulting stresses may radiate throughout the head, neck, and even involve the back. The pain may be constant or intermittent, lasting minutes, hours, days, or even years. Many patients describe the pain as a migraine headache. Eventually a patient may demonstrate clicking, grating, snapping, or popping sounds in the joint. The lower jaw may be over closed (too close to the upper jaw), and /or distally displaced (too far back in the joint or socket). Also, the lower jaw may deviate to one side due to interfering tooth cusps (points on the chewing surfaces of teeth that do not meet properly with the opposing teeth). The cause is multifaceted, i.e., loss of teeth, poor alignment or natural wear of teeth, grinding or clenching of the teeth day and night, poor tongue position, a muscle imbalance in the tongue and the facial muscles, chronic mouth breathing, osteoarthritis, rheumatoid arthritis, trauma, clicking popping joints, jaw pains, etc. To determine if an improper relationship exists between upper arch and the lower jaw, it is necessary to relax the muscles of mastication (chewing muscles), then close the relaxed lower jaw on a trajectory that is not strained. In other words, the mouth closes where the muscles are most comfortable. When the left lateral pterygoid muscle are in a state of “spasm” or “contraction” the temporomandibular joint (condyle) will move posteriorly (BACK) and the disc will slip anteriorly (forward) resulting in the disc to be entrapped behind the articular eminence and in front of the condyle (this results in clicking and popping joints). 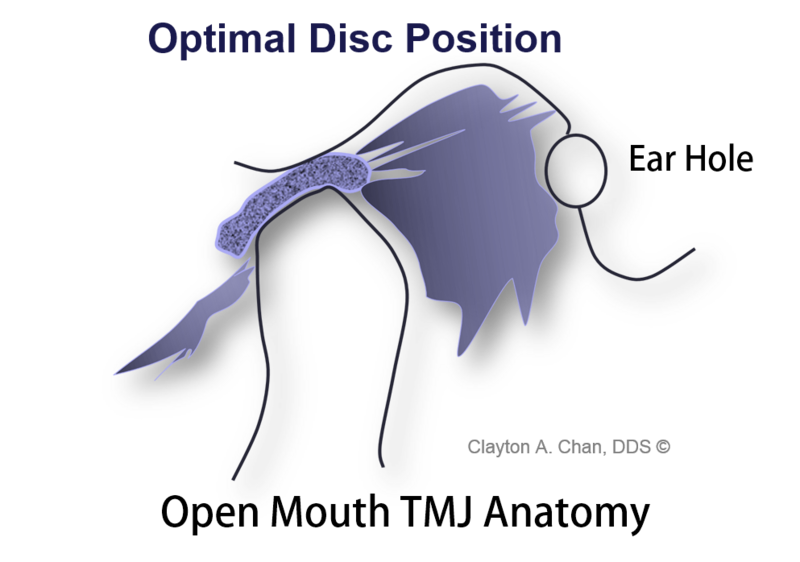 The normalized disc should be positioned over the condyle and not in front of the condyle. When the disc is no longer in the optimal functioning position the condyle loses its vertical position within the glenoid fossa causing the posterior molar teeth to contact more than they previously were. The anterior teeth will often exhibit a slight open bite (a diminished over lap of the anterior incisors) all due to the disc slipping off into an abnormal anterior/medial position. To relax or deprogram the spastic muscles of mastication, a gentle pulsating stimulus (low frequency TENS) is applied to the skin for approximately one hours. Multi-channel electromyography (EMG) is used to verify the degree of muscular relaxation. 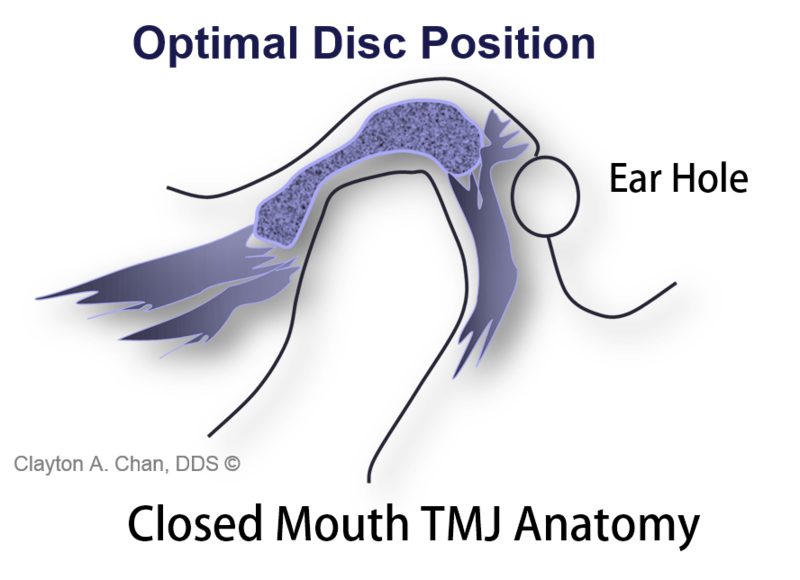 Specific disc reducing protocols are implemented and used by OC trained dentist who understand disc/TM joint optimization protocols. (Read more about Bite Optimization). TMD/MSD is not a rare condition. Every patient has some degree of Musculoskeletal dysfunction. It is when symptoms are manifested that people seek help. Many patients tend to clench and/or grind their teeth in response to unconscious stress, creating muscular dysfunction. This usually occurs during sleep, but it may also occur during a stressful daily experience. Resolution of unconscious stress which cause symptoms indicated on the Screening questionnaire may require stress counseling. Subconscious stress must be controlled for successful resolution of clenching and /or grinding of teeth. Undiagnosed brain tumors can also exhibit debilitating symptoms similar to TMD causing some patients to turn to drugs to alleviate their symptoms, or on rare occasions, even contemplate suicide. It is advised that TMD patients should also consult their physician and have any abnormal medical condition ruled out prior to TMD treatment.